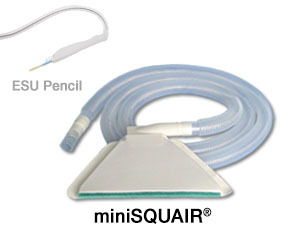 In contrast, Nascent Surgical’s miniSQUAIR® (mini) has capabilities that have been tested at independent laboratories and, most recently, its potential as an infection control device was discovered after a retrospective analysis of 998 consecutive posterior spinal fusion patients from a single surgeon’s practice1. We believe that the most critical element of a smoke capture device is its proven ability to capture smoke! What a novel idea!! An obvious requirement, no doubt, but often overlooked by the purchaser who will usually assume that the device will do as promised without data to support the claim. The unit of functionality for such a device is defined as “percent (%) smoke capture efficiency” and its minimal performance has been defined by the International Standard Organization as “90% capture efficiency” (ISO 16571 published in 2014)2. We must remember that such capture devices are, by themselves, functionless and require a turbine or evacuation machine to provide the suction needed to remove the plume from the operative field. Here, then is where we must begin to differentiate between Value and Compliance. How can an operating room Director expect Compliance if the evacuator machine makes more noise than the surgeon can tolerate? It is the noise level of the evacuator that is most often cited as the cause for refusal to use smoke removal technology. Most of these machines operate at or above 50-55 decibels which is close to 60 db which causes hearing loss with long exposure. Today, there are models that function below or at 45 decibels which is acceptable and tolerated by the clinicians. So much for the noise; now let’s tackle the next issue which is how powerful is the machine? In order to capture the rapidly rising and dispersing smoke column, the machine needs to be able to generate a minimum of 24-25 cubic feet per minute (CFM) of air flow which also will capture the ambient air that surrounds the smoke3, thus satisfying the minimum capture requirement described in ISO 16571:2014. What is the operational noise level of the machine (db)? What is its maximum operational air flow (cfm)? Once the right evacuator is chosen, we can now proceed to discuss the choice of which passive capture device to purchase and why. Both the “pencil” and the “mini,” require flexible tubing to carry the captured plume to the ULPA filter for “cleansing.” Tubing diameter is critical since maximal air flow through 3/8 inch I.D. tubing, even when using a dedicated smoke evacuator, is limited to 17-19 cfm. In contrast, we know that 24-25 cfm of air flow is needed for effective capture. This explains the documented average efficiency of the “pencil” that uses this size tubing as 51.4% versus the “mini,” that uses 1 ¼” I.D. tubing, as a 98-99.5% efficiency when tested under identical conditions4. Now it is time to ask, “What Value does a high capture efficient device such as the miniSquair®, provide to the purchaser? Let’s begin by pointing out that it will, when paired with an effective smoke evacuator, protect the perioperative team members by removing the nanoparticles which comprise 80% of the plume. It may surprise you to know that chronic inhalation of nanoparticles can, depending upon individual genetics, preexisting illness and dose/duration of exposure, lead to serious systemic diseases. They include neurodegenerative diseases, cancers, collagen and cardiovascular diseases5. High capture efficiency also enables removal of bioaerosols. This story is just starting to unfold for clinicians but suffice to remember that contamination of wounds from bioaerosols, present in ambient air around the surgical field, can lead to infection despite modern day protocols6. The “mini” gives the surgeon an added layer of protection because of its documented ability to completely capture airborne-transmitted and significantly decrease droplet-transmitted bioaerosols7. Such experimental data was used to justify a recently presented retrospective study mentioned earlier. Results showed a 72.7% decrease in superficial wound infection rates and a 71.4% decrease in deep wound infection rates when the “mini” was used versus when no smoke evacuation was used. In a subdivided group of these patients with only lumbosacral cases reviewed, the decrease in infection rates for superficial and deep infections respectively were 75% and 80%. Protection of the perioperative team from the short and long-term ill effects caused by chronic inhalation of nanoparticles . Possible protection of the patient from the potential effects of bioaerosols that are present in the ambient air that surrounds the surgical wound. Kim S, Schultz L. Can Capture of Surgical Smoke Decrease Post-Operative Infection Rates (SSI)? Preliminary Report. Poster #311 presented at the 18th Annual ISASS meeting, April 11-13, 2018, Toronto Canada. ISO 16571:2014. “Systems for Evacuation of Plume Generated by Medical Devices.” Publisher ISO. March, 2014. Schultz L, Drogue j. Unique Devices for Efficiently Removing Surgical Plume. Surg. Serv. Manage. 2000; 6(4): 8-12. Schultz L. An Analysis of Surgical Smoke Plume Components, Capture and Evacuation. AORN J. 2014; 99(2): 289-298. Buzea C, Pacheco II, Robbie K. Nanomaterials and nanoparticles: sources and toxicity. Biointerphases 2007; 2(4): MR 17-MR 71. Armellino D. Minimizing sources of Airborne, Aerosolized, and Contact Contaminants in the O.R. Environment. AORN J. 2017; 109(6): 494-501. Schultz L. Can Efficient Smoke Evacuation Limit Aerosolization of Bacteria? AORN J. 2015; 102(1): 7-14.